Mission Viejo – The Newport Harbor and Trabuco Hills girls lacrosse team have been to the county semifinals a combined one time. Last year, the Sailors made the semifinals by upsetting a higher seed on the road by one goal. The sixth-seeded Sailors will be advancing to the semifinals for the second consecutive year after rallying back to beat third-seeded Trabuco Hills 9-8 on Thursday at Trabuco Hills High School. Thursday’s win also marked the first time that Newport Harbor beat Trabuco Hills since 2011 and the first time under the guidance of coach Matt Armstrong. The two teams met on March 7 where the Mustangs won 13-7 at Trabuco Hills. This time, there wasn’t going to be a blowout. The two teams were tied at 2-2 in the first half when the Mustangs reeled off three consecutive goals. The Sailors scored thanks to a goal from Caroline Farley with six seconds remaining in the first half, but that was enough time for the Mustangs to score, as Hennessey Evans took the ball on the ensuing draw and made a Hail Mary goal that bounced high and snuck past Newport Harbor goalie Jade Rettig. That goal turned out to be Evans’ 100th of the season, and a big one for the Mustangs, as they led 6-3 at halftime. The Mustangs led 8-4 at one point in the second half thanks to two consecutive goals from Evans until Newport Harbor scored two consecutive goals. To try and slow down Newport Harbor’s momentum, Trabuco Hills coach Scott Leong called a timeout when his team was up 8-6. The Sailors tied the game at 8-8 thanks to goals from Sarah Farley and Lysie Kenney and took the lead at 9-8 thanks to a free position goal from Heather Roberts. With about seven minutes remaining, Leong took another time out. After the time out, it was a defensive battle between the two teams. With about 50 seconds remaining, Trabuco Hills got the ball back and Evans earned a free position with 18 seconds remaining, to try to tie the game and send it to overtime. Evans fed the ball to teammate Juliet Mooney, but Newport Harbor goalie Jade Rettig made a big save and ran down the clock allowing the Sailors to punch their ticket into the semifinals. Evans led Trabuco Hills (14-4) with five goals while Mooney, Avery Friesen and Sherry Hsu had one goal apiece. Goalie Ashley Bell had eight saves for the South Coast League champion Mustangs. For Newport Harbor (13-5), Kenney, Sarah Farley and Adena Rothbard had two goals each while Caroline Farley, Roberts and Katie Hendrix had one goal each. 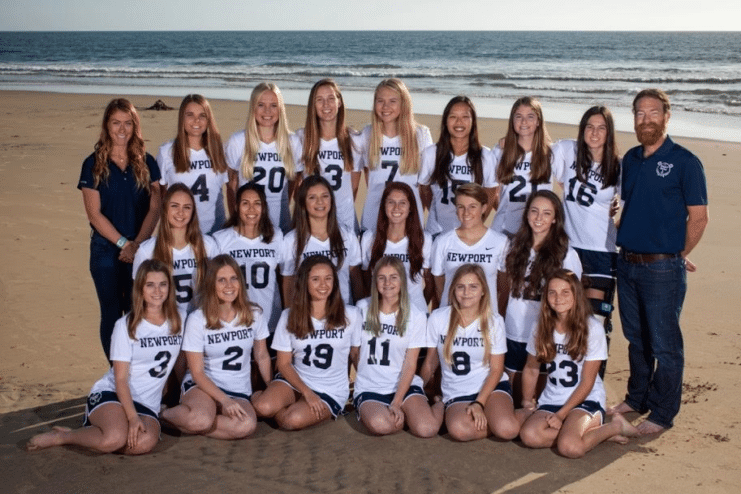 Rettig made nine saves for Newport Harbor, which has equaled its win total from last year. The Sailors will play No.2 Foothill in the semifinals on Saturday at Portola High School in Irvine at 12:45 p.m. The Sailors, who have not beaten the Knights in team history, lost 11-5 on April 6 at Estancia High School, but didn’t have the services of Rothbard (concussion).